Easter Week open will do rate of $1100 for the week!!! Enjoy our beautiful private sandy beach or a few laps in our lovely heated pool, surrounded by lounges and tiki huts. Also available is a shuffle board and horseshoe court for your entertainment. Nearby are restaurants for every budget and taste, lounges, grocery stores, shopping malls, and a golf course. Just offshore is our famous coral reef. Nearby dive boats show you the wonders of the undersea world. Scuba diving and snorkeling lessons as well as guides are also available. We're located right in the middle of the world class Florida Keys fishing grounds. Our condos have two bedrooms, two baths, and fully-equipped kitchens. Laundry facilities are available. Sorry no pets, trailers, or boats. Heated pool, Gas BBQ, Private beach. Walk the sandy beaches in either direction almost a half mile. Our family of 4 (two adults and two young kids) really enjoyed staying at the condo. 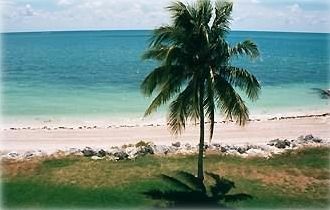 It's in a perfect location in the keys for exploring -about an hour drive to either Key West or Key Largo and only 35 minutes to Islamorada or Bahia Honda. And it's a great place to just "stay local' too. It's a short walk to Sunset Park for the nightly sunset festivities and about a half mile walk for a morning coffee. We paddleboarded through the canals, to Sparky's Landing for lunch, and back around along the coast, which was really fun. The kids loved the pool and having a beach on-site was a bonus. There are a few sand toys and a small cooler for use, which were appreciated. Overall, we really enjoyed our stay at the condo and our time in the Keys. We would definitely recommend! My husband, and my two daughters and I drove down with to spend 11 days at Diane's wonderful condo. The beach access was amazing. We enjoyed the pool and the beach so much! We made time to snorkel at Captain Hooks, AWESOME and there is an online coupon. We loved the Sunset Grille. The kids loved the pool while eating. It is expensive but the views and food make it worth it. We spent two different days wandering Key West, drove up the Keys to kay Largo and just enjoyed great family time. The condo was gorgeous. Super clean, nice decorations and so close to everything. We loved the area and the location. It was safe enough to bike and to let our girls bike by themselves. Don't miss the chance to kayak in Bahia Key! The Turtle Hospital and aquariums are must see! Can't wait to visit again next summer. It was the perfect week. My husband and I needed some down time from our crazy life and my 15 year old son needed to detach from the electronics.. Diane made everything so easy, from sending out info about things to do to booking her condo. She has everything you could possibly need ready and waiting for you, just pack your swimsuit , shorts , t-shirts, flip flops and GO! We bought fishing poles from captain hooks and rented bikes and kayaks from wheels to go. We spent the week connecting to the outdoors, it was perfect! In the evening we would hop in the pool before going to dinner, the pool was spotless, relaxing and never crowded. There is so much to do I can't list it all but the dolphin experience was really nice I don't recommend the expensive packages, we had a blast just watching. There are plenty of restaurants nearby our favs were sparky's landing, havana jack's and key colony inn. I do not recommend Leigh Ann's coffee house it's just a rip off go to IHOP instead. Definitely take the trip to Robbies of Islamorada, feed the tarpon and stay for lunch..Don't forget to enjoy the beach just steps from the condo and relax on one of the loungers provided.. This was just the perfect place to unwind and recharge us. Thanks Diane! Great property, great unit, all the comforts of home. Nice central location to explore the Keys. The beach at the complex was better than Sombrero Beach. Very laid back and relaxing trip. Thanks Diane! This Condo was cute, comfortable, and calming! The owner goes above and beyond to make sure you have the perfect beach vacation. The groundskeepers are nice and informative as well. A few MUST SEE places: Turtle Hospital (my favorite), Robbie's in Islamorada (make sure you feed the tarpon! ), & Grecian Rocks in Key Largo. Of course venture down to Key West and check out all the fun! Our favorite restaurants: Sunset Grille & Raw Bar, Robbie's, & Castaway. Marathon is the perfect place for adventure and rest & relaxation! However, it would not have been complete with Diane and her hospitality! Thanks Diane for helping my family create memories that we will all cherish forever! This was my third visit in six years to the Sea Isle condos. The condo and the grounds are beautiful and well maintained. Diane is great to work with and the condo is well equipped with anything you may need during your stay. The units are beautifully decorated. We have stayed in both the first and second floor unit. Each has it benefits. The view of the ocean from the second floor balcony is a great way to start your day with your cup of coffee. The convenience of the first floor with no steps to climb. Either unit you stay in your are a winner. The pool, the grounds, the tiki hut with gas grills, lounge chairs everywhere on the lawn while watching the ocean and catching a wonderful breeze. I can't wait until my next visit to the Sea Isle . Great location right between Key Large and Key West. Not far from the Everglades National Park. Very convenient location.